For more casual days I’ve been loving a high ponytail, I leave my parting showing instead of scraping it all back and leave a few pieces flowing free at the front. I’m not overly careful when pulling it up into a high position which gives a lot of height at the crown. After securing it tightly I pull at the roots around the front of my hairline which gives a little more body to the sides, before popping hair slides all over the gaff to keep the body and height. When I want things to look slightly more pulled together (only slightly, it’s still a messy ponytail after all) then I opt for a low pony tail with loose pieces around the face a little backcombing for lift and, again, a lot of hair slides. This style in particular is one I don’t think I’ve ever been drawn to before, but with shorter hair I’ve been loving it! 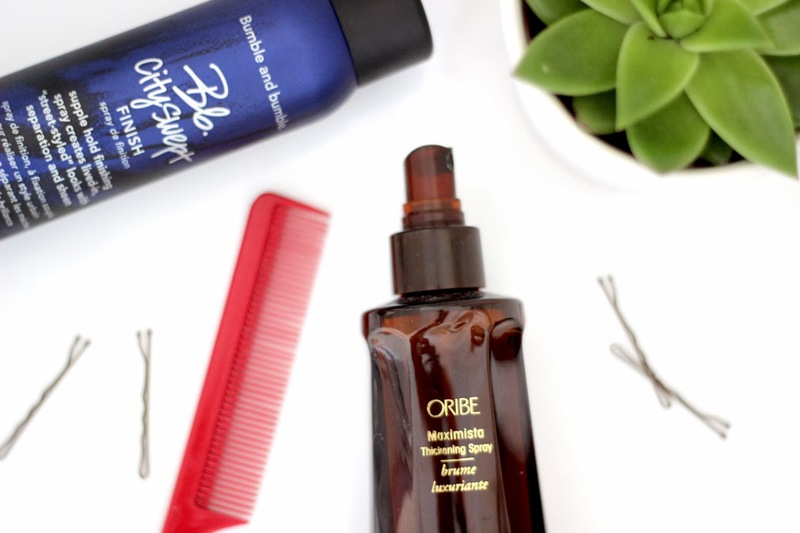 With both styles I’ve been using my Oribe Maximista Thickening Spray before styling. A quick blast with the hairdryer later and (I feel like) I’ve got a lot more hair to play with. I also love using texturising sprays when I’m pulling my hair back, as they tend to give my hair a lot more grip which helps make the styling process much easier. I normally use the Bumble and Bumble DrySpun Finishing Spray*, but recently I’ve been using their City Swept Finishing Spray*(which you can get here if you’re US based) instead as it works much better with my hair type – keep your eyes peeled for this one, it’s a goodie. This looks so gorgeous on you, I'm jealous because pony tails don't suit me at all! Looks lovely. It's my go to look for lectures! You look lovely with a ponytail! I have to have my hair up on a daily basis so unfortunately a ponytail is my everyday style..
That's a lovely hair style ! Whenever I put my hair up in a messy ponytail and I have nowhere to be or don't have to leave the house it looks lovely but when I know I need to go somewhere my messy ponytail always looks rubbish hehe. I think I'll need to do a couple of more practice runs! 🙂 Love this post!! Very adorable 🙂 The lighting in your photos is always so fantastic! Also a long-term Olsen fan here.. I don't know what it is about them! Love the ponytails. My hair was too short to tie up for about a year so I really appreciate a good ponytail! I love wearing my hair in a ponytail, it's so effortless and gets annoying hair out of the way! Looks gorgeous on you! I really love the high ponytail look. Really suits you too! I used to wear my hair is such tight pony tails…slicked to my head 🙁 CRINGE!!! Its also the look I tend to go for for work, although mine tend to be a little less messy, more pulled back. Unfortunately the messy look just doesn't suit me. You are so beautiful with your hair that way! You always look so chic and parisian, I really love your effortless style! 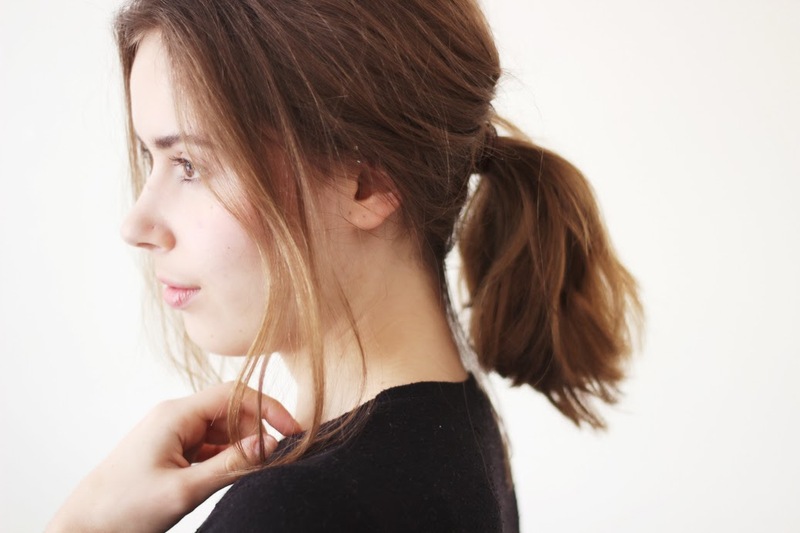 You cannot beat a messy ponytail, it looks so cute. Really suits you, I love a messy ponytail! A messy pony is one of my go to hair styles along with top buns! Because I have longer hair I tend to go for a high pony and just leave it slightly loose so it's not too harshly pulling my hair back. Who could say no to such an easy hair style on busy days? I love that it is so simple but looks amazing at the same time! Messy pony tails are a daily occurrence for me. I am so lazy. It's a ponytail most days for me! i love ponytails honestly….although the only time I ever pull my hair up is when i'm in serious 'head down and work' mode. You look lovely. Your hairstyle will look great if your hair is healthy and shiny. In my own experience, nutrition is the most important thing to make your hair healthy in a long term.